UNITED NATIONS, March 1 -- The allegation that Cote d'Ivoire's defiant leader Laurent Gbagbo received three attack helicopters from Belarus, made on the morning of February 28 by UN Secretary General Ban Ki-moon, has been rejected not only by Russia but even France, Inner City Press learned on March 1. The question for and from some is, was it intentional? The Brazilian Permanent Representative, president of the Council for February and ongoing chair of the Cote d'Ivoire sanctions committee, told Inner City Press that she had spoken with Belarus' charge d'affaires as early as Saturday night, resulting in a strong denial. The allegation was that the flights had occurred on February 26 or 27, and the consensus Monday morning was that no such flight happened. 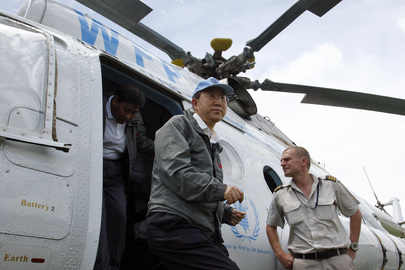 So why did Ban Ki-moon do it, and then his Secretariat tried to erase some reports on it? We have asked Ban's spokesperson's office, for today. Watch this site. Footnote: speaking of consensus, it is predicted including by Russia's Vitaly Churkin that the General Assembly vote to expel Libya from the Human Rights Council, scheduled for Tuesday at 3 pm, will be unanimous, after which Russia (and Egypt, China and Venezuela) should speak. We'll see.